I Got My Phone Back From Thieves in Phnom Penh. There Was Perhaps Some Blackmail. Photo of a mosque in Singapore I thought was cool. Presented without comment. I got my Galaxy SIII back after it was stolen in Phnom Penh on Friday. There was some mild blackmail involved. I am writing about it, as one might expect. The names and identities of all involved will be blurred out since they did come around and gave it back. If you’d like the whole story, do call or text. Rather chuffed that it actually worked out. I believe I will take advantage of the AirAsia flash sale and head to Kuala Lumpur and Malaysia for a bit. Still trying to figure out Yangon—it’s so darn crowded and expensive right now. But may have a nice alternate solution. Visa is good until Christmas, so plenty of time to get things sorted. I had way too much fun doing this very, very silly story on the (very real) dangers of Lake Tsunamis in Switzerland. Really, you could die in Switzerland from a tsunami in a pretty alpine lake. I have no idea why this amuses me so much. I also did this piece on Historical Memes – IE, what would have been a meme if we’d had the Internets during great hilarious moments in history? Naturally, Dukakis featured large. Singapore in its less boring areas. I was riding the Metro in Singapore, and I experienced what can only be described as extreme cognitive dissonance. 1. The car I was riding in was not rocking or shaking, or coming to a screeching halt. I could comfortably stand without holding onto anything at all, as long as I shifted my weight occasionally. 2. The Singaporean metro car was spotlessly clean, and had little TVs playing advertisements and movie trailers at pleasingly low volumes inside of it. 3. No one was: eating, making out, swinging from the rafters, fighting, or screaming about the ceaseless onslaught of Lizard People on our finest cultural institutions during my ride. If you have lived in Washington DC, this likely would feel as exotic to you as it did to me. OK, I know: Singapore is an exceptionally wealthy city-state that has much more ability to put together an organized, attractive metro system than that which exists in Washington DC. Further, the Singapore MRT opened in 1987, whereas the Washington DC version has been around since 1976. (Though the general decency of London’s Tube indicates this isn’t really a great excuse, either). SHINY. Almost makes up for that whole execution thing. There is evidence the DC Metro can be pretty good. A recent thread on Unsuck DC Metro dealt with readers memories of the system in the past. The general consensus is that was quite excellent, a real improvement on the New York City system—and then sometime in the mid-2000s, it began to go a bit pear-shaped. And now DC residents are stuck with an undependable and expensive Metro system that adds even more stress to the lives of already exceptionally strung-out Beltway types. This is not an optimal situation. We live in what is supposedly the wealthiest, most powerful nation in the world. Why can’t we get public transportation right? You might be able to persuade me to give up Trident and flagrant public littering for that—although I will cede that Singapore’s record on executions is….not the greatest. The New York Metro is fine. I don’t really have an issue with the BART. I can’t say I’m very familiar with the systems elsewhere in the USA—unless you count the New Orleans trolley system which…you probably shouldn’t. I will cede that Singapore is boring. This is something of a feat, considering the city-state’s remarkable diversity and its tropical location. Sometimes one almost wishes for a dread pirate attack, or a Godzilla incursion, or something that wasn’t aggressively pleasant to take place. (Let’s leave out Japanese invasion by bicycle. That was bad). About the only negative aspect of Singapore is that one becomes extremely sweaty, no matter what you do, all the time. And things are expensive (though having come off DC – it’s not really THAT bad). I might trade boring for a functioning public transport system, even. We’ll see. Surely there is a more tactful way to describe well….this. PHNOM PENH — Cambodian mourners gathered at the Royal Palace in Phnom Penh by the thousands on Tuesday night, marking the final day of the official mourning period for deceased King Norodom Sihanouk, who passed away last week at the age of 89. Scores of Buddhist monks arrived at the Royal Palace Tuesday afternoon, where they performed a mass meditation to honor the memory of Sihanouk. They arranged themselves in a vermillion triangle outside the Palace, and their chants mingled together with impressive force. Quite proud of this GP piece. Was a nice, tiring day of clambering around on top of things trying to get a good view. No luck photographing the moon, you shall have to squint your eyes for signs of Sihanouk yourself. I believe I stepped on the back of many people’s heels in the crush of mourners today, but the favor was reciprocated. Many thanks to my friend Alex Higgins. for helping me with this one. The people do not stop coming to mourn King Sihanouk. My sources say that the ruling party may not be particularly chuffed about it: an up-swelling of support for the fading, toothless royalty, what was once the most potent counter-balance to Hun Sen and the CPP. The monks are there, of course—hopefully grown accustomed to us Western voyeurs (and Khmer journalists, it must be said) putting cameras in their faces at all suitable moments. They meditate in the rain and organize themselves in groups outside. They are probably looking for karma. That is the motivation of most of the people out there, I suppose. That and a curious, once-in-a-lifetime social event. Then there is the generation right behind them, who suffered the Khmer Rouge and remember it with painful clarity. Fewer of them, likely, are ardent supporters of Sihanouk: they know that he allied himself with the KR in an effort to wrest back power from Lon Nol, and they remember the divisiveness of 1997, the post-war years. They do not have clear memories of that 1960s counterbalance, when things clearer: their minds cast back more clearly to a bloody, deprived recent past. Which leaves us with the kids, Cambodia’s most-liberated generation, who buzz around town at ridiculous speeds on Scoopy scooters, who dress themselves in the latest fashions and make out delicately in the park. Their memories of the KR years are non-existent: things have been OK for them, mostly, and are (mostly) getting better as the years go by. What would they care about Sihanouk and the voices of the past? Why do they come out in droves? Perhaps they are influenced by their parents, their grandparents, who have told them about the old days. They are not foolish: they understand the gravitas of the situation. Sihanouk is an abstract proposition to them, but god-kings are of necessity abstractions, especially when they have died. Sihanouk is in the moon now, apparently: it came out at midday yesterday and people gathered in the streets marveling at it, craning their necks back. A Khmer scholar told me that the people saw Sihanouk in the men back in the 50s and 60s, when they had won independence from France and the god-king in making was on the rise. This was when the people were more superstitious, he said. The guestbook is overflowing – I imagine they are collecting hundreds upon hundreds of the things. I would love to read the entries. People jostle each other to write something in. The palace is obscured by grey incense at night, and likely during the day, as well. The smell pervades my clothes whenever I come back from taking photos and I welcome it. The smoke mingles with the lights of the palace and is rising, ultimately, upwards – towards the moon, it looks like. I first came by the Royal Palace post-Sihanouk during the day, when it was hot and sweaty, around 4:00 PM when the afternoon heat has not yet dissipated over the river. There weren’t a lot of people out there, and I was somewhat surprised: had the mourning period for Sihanouk, at least in front of the Palace, blown over so quickly? Well, I was wrong. Turns out a lot of people were, quite logically, coming out to the Palace to pay their respects during the relative cool of the night. There have been problems with old ladies (many of them ardent fans of Sihanouk, who remember him when he was young and dashing) fainting while they do their alms and light their candles, and it’s not exactly pleasant for everyone else—so, the night-time. It’s a beautiful scene out there at night, now: little orange candles flickering on the pavement, incense smoke rising up over the illuminated Palace and the portrait of Sihanouk, and many, many people lighting incense and laying lotus flowers in front of the royal potente’s former seat of power. I suggest you go out and see it. Far as merchandise goes: there were no t-shirts for sale outside the palace today, but photographs and the usual assemblage of black ribbons. I am inclined to buy a photograph or two—I had the thought last night that I am very lucky to be here in Cambodia at such a pivotal time in its history. After all, the death of Sihanouk is deeply symbolic, and many are worried that the balance of power between the King and Prime Minister Hun Sen has now been fundamentally shaken—the checks-and-balances between the two are gone, the power of the royal family officially sapped. This explains the aura of trepidation in the air. It is hard to imagine any Khmer politician being mourned in such a way, and so universally. Further, Sihanouk functioned as something of a beacon of hope for many. A friend observed last night that Sihnaouk was something like “the rainbow after a storm”—he would appear whenever something went right for Cambodia, be it independence from the French in 1953, or his 1991 return-from-exile. He might flit off the scene again, returning to his well-appointed homes in Beijing or in North Korea, but he would appear when he was symbolically needed—and for most, that was quite enough. Westerners have a decidely more cynical approach to Sihanouk, and that is logical enough: he was a deeply complex figure, he made many mistakes, and he maintained to the last a certain, discomfiting aura of selfishness—he was human, and this was a fact he able to acknowledge. “For God’s sake! If I ran a dictatorship, then what is Lon Nol running? I renounced my throne to show the masses that there’s no such thing as divine right, that no one descends from the heavens to rule the people,” said Sihanouk in Beijing in 1973. (Quote obtained via Nate Thayer). He called Cambodians his “children,” but we outside observers should remember that most Cambodians were quite content to fill that role, and remain so. It is my suspicion history will be kind to him. I cannot help but think of Ronald Reagan, who is becoming more and more a symbol of a better-time in the USA for many average people. Make your intellectual arguments against these symbolic leaders all you want, but the regular people will hold onto them: and they cannot really be blamed. They are representatives of hope. There is little flinty and rational about that. The hardest part of re-adapting to Asia is re-adapting to the weather. I favor hot, sticky climates and will doubtless do so again, but I also caught a cold while en route, which means the combination of congestion and humid weather makes it somewhat difficult for me to breathe. I apologize to the nice Singaporeans having to listen to me make strangled hacking sounds. I definitely like being places where noodles with fish balls, ground pork, mushrooms, chili, and little dried fish is considered a perfectly standard breakfast. I had forgotten all about the mutable nature of prices in Asia – even in Singapore – and only remembered when I accidentally bargained my way into a decent price on a new battery for my camera because I’m cheap and tend to walk away to price-check things on my phone, even in the USA. Then I remembered. Memorial plaques at Fort Canning, near the Governor’s Residence. Walked up to Fort Canning this morning, which I managed never to do on my previous visits. It’s a little stretch of Malaysian jungle in the middle of the city, which I liked, although I am feeling increasingly bad about having never actually visited Malaysia or Indonesia. (You’d think all those damned TRULY ASIA commercials would have got me properly motivated by now). I wandered around by the tombs of the Malay Kings and Raffles former bungalow – read his letter to a Duchess back home and now want to read more about him/by him, as he seems like an interesting guy. The memorial plaques featured above are interesting, and I’ve always had a morbid interest in reading the memorials of British colonialists who died of some fell tropical thing while sojourning in the colonies. I was actually rather impressed that most of the plaques were for people who’d died at the relatively venerable age of 50, though maybe that’s just the age you needed to be for someone to bother making one for you. That’s a scary thought. Back out go see some more culture, cold-be-damned. I’m pretty sure it isn’t Crimean-Congo Hemorrhagic Fever. I hate cold weather. That crisp air that evokes happy thoughts of apple cider, sweaters, Kennedy-esque football games and bonfires? Screw that. I spend most of my time in cold places huddled up by the nearest source of warmth, feeling slighted by the cruel, cruel whims of the universe. This might explain why I moved to Southeast Asia. There is one thing I like about fall: fresh figs. Figs are awesome. They are curious-looking orbs of delicious and I will hear nothing against them. They are even better if you braise them with chicken, honey, sweet onions, and a dash of vinegar. You can thank Judy Rogers of San Francisco’s Zuni Cafe for this innovation, but I’ll walk you through it all the same. I’m a benevolent person. Also, a cold person who wishes like hell she owned more fluffy socks with moose on them, or whatever. Fresh figs – brown or green, whatever. Chicken stock (About a cup and a half. Depends on how big your chicken is). 1. Get some chicken. Good chicken. This is especially salient if you’re a California elitist who agonizes over GMOs a lot, but take it from this hot-tub liberal: the good organic stuff does taste better. A whole chicken. Keep the back and guts and make stock. Don’t be a wuss. 2. Get some olive oil and a big pan you can braise things in. Heat up some olive oil, and saute the chicken until it’s browned. This would be a good time to slice up your onions. NOT chopped. 3. Once the chicken looks adequately browned, add enough chicken stock to mostly cover the meat. This is not exactly a science. Swirl in a tablespoon of honey to taste. Then add 2 tablespoons of cider vinegar. 4. Nestle the sliced onions in among the meat. You can also add a few of the figs at this time if you are feeling sassy. 5. Braise on low heat for a couple of hours. You want the meat to be falling apart. About halfway through the cooking time, add the rest of the figs. 6. Serve with: polenta, mashed potatoes, blended cauliflower, whatever floats your boat. I like to make broccoli rabe or broccoli stir-fried with mustard and butter with this. Meet Condescending Biden! He’s like Condescending Wonka, but with about 100 percent less Gene Wilder. And more malarkey. You can make your own Condescending Biden here. Hey, you know what’s awesome? Goddamn Maya Warrior Queens. El Peru Stela 34. Via Olivia Navarro-Farr. “The tomb of a Classical Mayan queen has been discovered in Guatemala, in a remarkable find that sheds new light on the role of women in early Mesoamerican cultures. 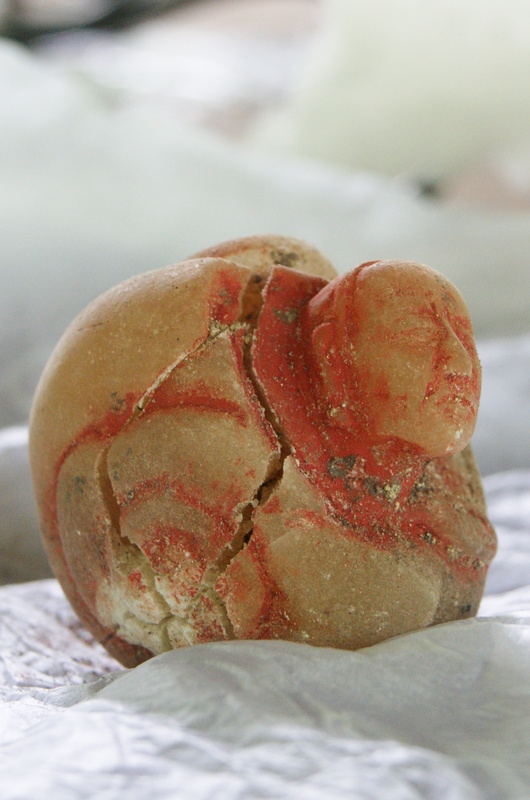 To find out more about the queen, known as Lady K’abel, and the findings at the El Peru-Waka archeological site, we spoke with the woman who discovered her tomb: Wooster University archaeologist and assistant professor of anthropology Olivia Navarro-Farr. Alabaster jar with the image of Lady K’abel. Via Olivia Navarro-Farr. Navarro-Farr first began her research at El Peru-Waka in 2003. She was trying to address questions about why there was so much ritual activity surrounding a particular temple at the site, and much to her surprise, she got a very decisive answer: these worshippers were venerating a warrior queen. Lady K’abel ruled the Guatemalan city of El Peru-Waka with her husband, K’inich Bahlam, during the 7th century from 672 to 692, serving as the military governor of the Waka kingdom under the auspices of the House of the Snake King, to which she belonged.